And by wining I mean: chicken cooked in reduced red wine sauce, and by dining I mean: table worthy. By all means, make sure some of the wine makes it into a glass for you. Some for the skillet, some for me/you. Cooks deserve that. This one just made the cut. And not just because it tasted so darn delicious, but because it was easy to make with rewarding results and my kids kept asking for seconds. Oh, and because it is super budget friendly: I used all chicken legs (though thighs would work well too). 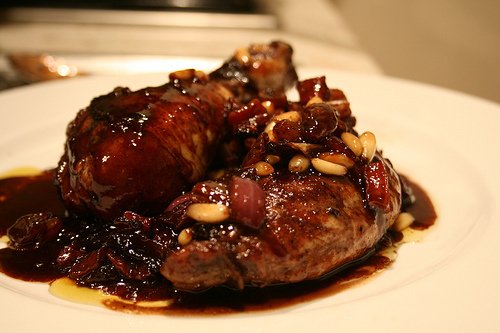 Chicken with red wine and balsamicServes 4. Snag 1 very large skillet, and another medium soup pot. In the soup pot over low/medium simmer the wine, cloves, cinnamon and brown sugar. It'll take a half hour for it to reduce to about a cup---at which point you should off the heat (then remove cloves). [In the skillet, quickly toast the pine nuts, then:] Heat olive oil over medium/high, S&P the chicken legs and saute ALL FOUR SIDES about 4 minutes each (you are aiming for caramel brown). Reduce to medium/low and add carrots and onion (and here you could add Italian herbs) and cook to caramelize, 10 minutes. Add raisins, pine nuts and the reduced wine mixture. Scrape up brown bits off bottom of pan, let simmer another 10 minutes. Add remaining wine sauce, 3 T balsamic glaze and simmer another 10 plus minutes. Season with S&P and serve. I LOVE serving over a pile of potatoes or sauteed greens. Meal ready!